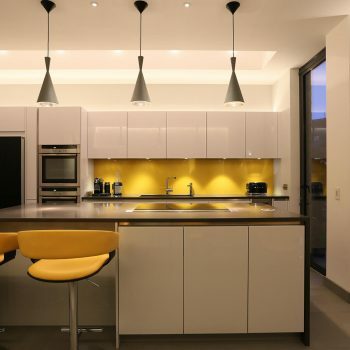 Sally Storey gives her top kitchen lighting ideas to make the most of this room which sits at the heart of the home and ensure you get your kitchen lighting design right. 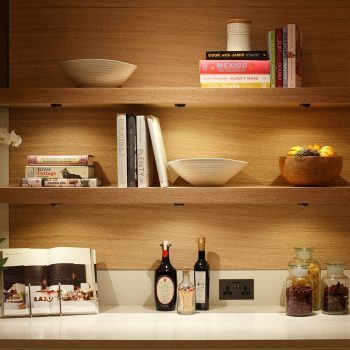 1.Top of my kitchen lighting ideas is to ensure great task lighting under your kitchen cabinets or shelving. This is key to ensure the best shadow-free light in which you work is provided. Etta Eyelid under cupboard lights as shown here are ideal for this. 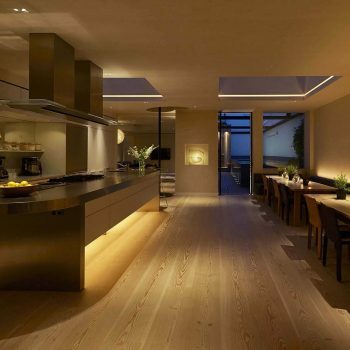 2.Never place downlights in a grid. Ensure they are placed only where light is required. Use a directional downlight such as the Polespring 50 to direct light to wash the front of your kitchen units. This will not only provide a soft reflected light to the space but also light inside your cupboards when they are open. 3.Always light the centre of a kitchen island either with LED recessed downlights or simple decorative pendants so you can see to work. Put these on a separate circuit to your perimeter lights for flexibility. Often for added impact a pair of Polespring LEDs look good or consider the Square Double LED, as shown here, for a contemporary look. 4.In a kitchen with high ceilings, look at visually lowering the sense of scale by adding low hanging pendants over the island. This can also help delineate the space in an open plan kitchen. 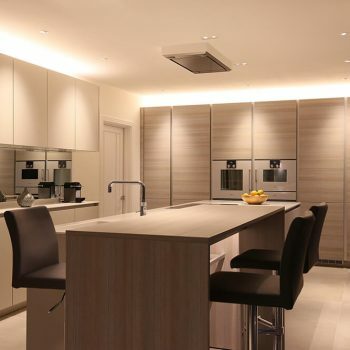 Add Polespring LED downlights in between the pendants to ensure that you have good task lighting on the work surface below. 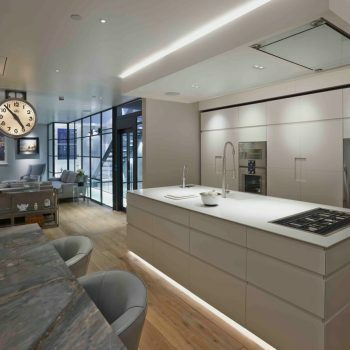 5.Consider adding uplight from the top of the kitchen cabinets to add more general light, this will also reduce the number of downlights required. Whilst adding Contour LED HD27 strips above light will reflect light into the space above. 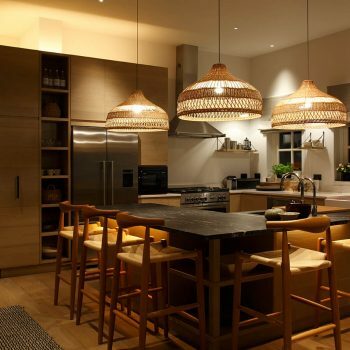 6.Finally add additional layers of lighting to add interest to your kitchen. Create a floating effect under your island using Contour HD27 LED strip or add Cazalla floor washers into a kick plinth to skim light across the floor. Add another layer at high level by concealing a Contour HD27 LED strip around a skylight.